Relations between the European Union and Russia are at a critical stage now. Though this is a permanent state for the past ten years. 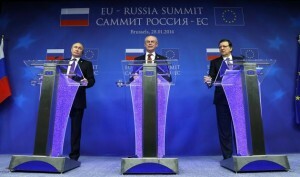 Ties between the EU and Russia have particularly deteriorated in the past several years. The economic sanctions against Moscow imposed in the summer of 2014, after then Ukraine’s Crimea voted in a referendum to rejoin the Russian Federation continue to have the strongest impact on bilateral relations. Considering the fact the European Union will likely extend its economic restrictions imposed on Russia for another six months [the issue to be discussed at the Brussels today or on Monday following Italy’s veto on automatic extension – OR], the EU should be ready for a new round of tensions. In other words common European political thinking once again can prevail over potential economic losses. Today is the very moment when EU should make the decision on further relations with so called “newborn” superpower. Bilateral relations could go two ways: strengthening ties or further distancing. There is no third choice. What is better? Every European state has its own point of view, and sometimes they differ dramatically. It is no secret that economic sanctions hurt both sides equally. Some experts say restrictions are the only way to stop Russia’s ambitious plans in Ukraine. The others consider them as dead end road. Possibly if not the rise of terrorism the relations will have no chances to improve in the near future. Neither the EU nor Russia are not going to change the position on Ukrainian conflict. But recent terrorist events in Paris lead to revision of views in some European countries on common efforts to resist spreading of this evil. Those European states that have already faced everyday terrorist threat at their homes agree to unite their efforts with Russia at least in one sphere – the fight with terrorism. Broad international coalition including Russia seems much more effective than without it. The last session of ‘honey-moon’ in EU-Russia relations one month before the coup d’etat in Kiev. It should be said that it is recent Moscow initiative to take on the leading role in the fight with terrorism has again placed Russia’s behaviour firmly under the spotlight and polarized opinions amongst European states about how the EU and its member states should respond. Some EU member states like Lithuania, Latvia and Estonia categorically refused to have something in common with Moscow. It is most likely due to the common painful past other than something else. In general the main problem of the European Union is the absence of consensus. Traditionally the European Union individual countries do what suits their own needs. This weakened the voice of the EU institutions. Political and economic interests of the organization as a whole and of individual states in particular very often contradicted each other. Economic ties with such huge country as Russia were always profitable. Not all EU member states are ready to refuse benefits even now. For its part, being greatly interested in cooperation with Europe, Russia developed its own mechanism of interaction with them. It chose countries where they can form any bilateral understandings and establish partnership contacts with them individually. And it really worked and for sure it will work! In any case the EU has to interact with Russia. Two sides are doomed to cooperate due to geographical and geopolitical factors. The question is in what way. In the latest development, making the right choice for the European Union is not only the matter of political image, wrong decision could also cost lives of Europeans. Adomas Abromaitis is a Lithuanian expatriat living in the United Kingdom.